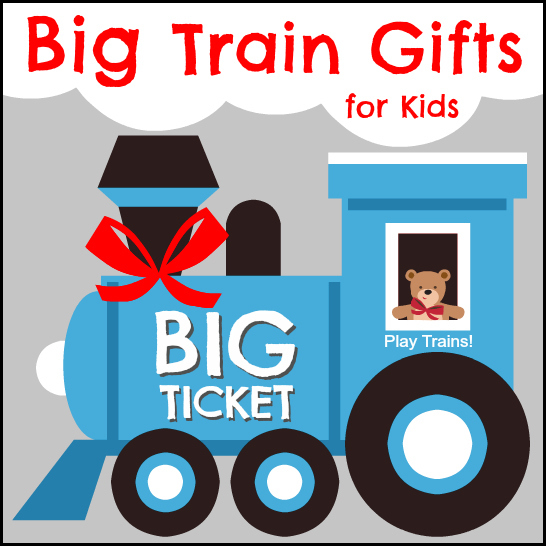 Whether you’re looking for that main birthday gift or the biggest present under the Christmas tree, celebrating a milestone or just looking to add something irresistible to the play room, this list of big ticket train gifts for kids has plenty of ideas for you! 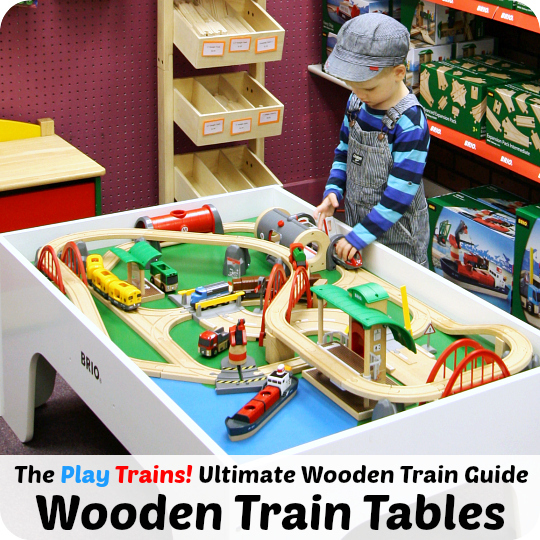 You’ll find ideas for toddlers, preschoolers, older children, and even teens, including wooden train tables, deluxe wooden train sets, ride-on trains, model trains for kids, motorized toy trains, train furniture for kids’ rooms, and gift-worthy sets of train books. There’s just something so special about that big train set under the tree, or that biggest birthday present, saved for the very last. Especially when there’s a new train set inside. For the past four years at our house, birthdays and Christmas mornings have been all about the trains. Even now that the Little Engineer is turning five, and perhaps would get more use out of more LEGO bricks than more wooden tracks, he’s informed me that his birthday is going to be a train birthday party. And all he wants for presents? Trains. 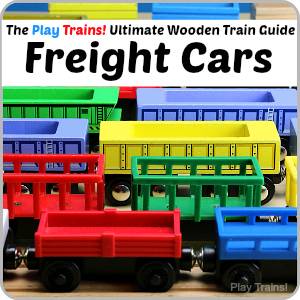 So if you’re looking for that wow factor gift for your train-obsessed kid, here are my recommendations. Below, you’ll find everything from a boxed set of Thomas books to deluxe wooden train and model train sets, from ride-on trains to train beds for toddlers. And hopefully you’ll find the perfect present for your little engineer. The Brio Deluxe Railway Set has been one of the most popular wooden train sets purchased through our Guide to the Best Wooden Train Sets. 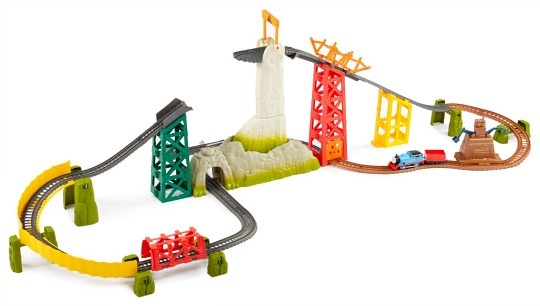 As I said there, if you’re looking for an all-in-one set with enough variety, durability, and playability to last a childhood (or several), the Brio Deluxe Railway Set fits that description perfectly. As someone who loves to build complicated wooden train layouts, I am incredibly impressed by the design of this layout: in the space of a standard-sized train table, the Brio designers have managed to fit an elevated/above ground passenger train line, a subway line, a freight train route, a roadway that connects to the two-level transit station, and a seaport with the coolest cargo ship ever to be made for wooden trains. 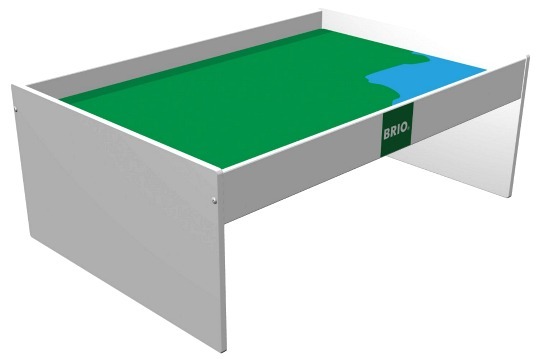 I love the simplicity of the Brio Play Table. The top is green, with just a little bit of blue, right where the seaport is in the Brio Deluxe Railway Set‘s layout. It adds some scenery without overly dictating the types of train layouts children can build on their own. The Thomas Wooden Railway Tidmouth Sheds Deluxe Set brings back so many fond memories for me. This is an updated version of train layout that used to be at all the bookstores where my son fell in love with Thomas. It comes with a super cool Thomas storage box (which is much larger than it appears in this photo) that has a cushion for a cab roof, so your child can pretend to be Thomas’ driver. How cool is that? 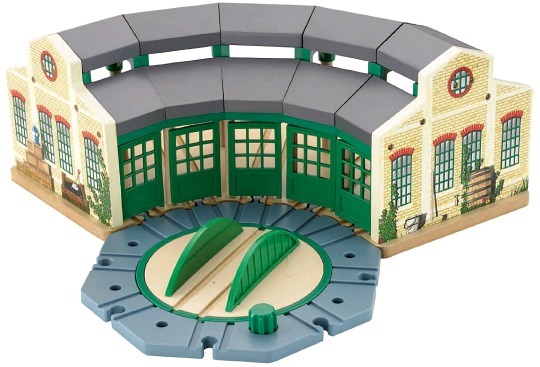 Plus, it features Tidmouth Sheds. 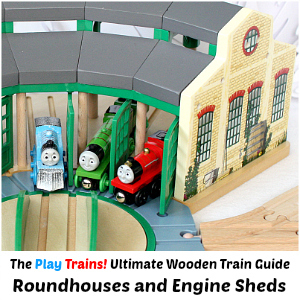 I feel that roundhouses and engine sheds add new dimensions to wooden train play, and Tidmouth Sheds is our favorite one. 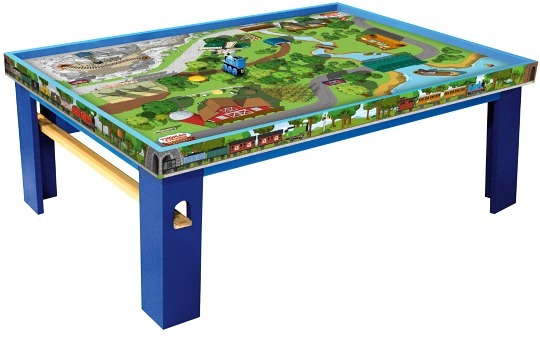 This is the new version of the Thomas Wooden Railway Play Table, so I don’t believe the play board is the design that was meant to go under the deluxe set. Still, I like this table. We’ve played on it in toy stores. I think the train track shelf is a particularly clever addition. Though, thinking of our train collection, it would have been even better if there had been several more of those shelves! The Up and Around Sodor Adventure Tower is an interesting new take on the train table. 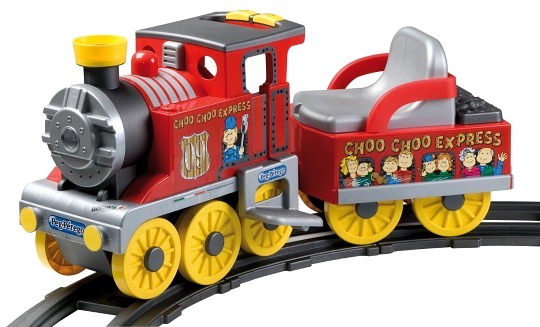 I’ve been impressed at Fisher Price’s attempts to do something new with the Thomas Wooden Railway line. 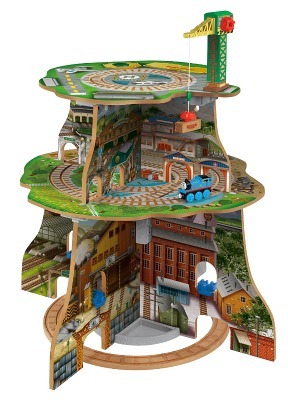 In this three-tier play tower, the wooden trains move through fully-illustrated backgrounds. 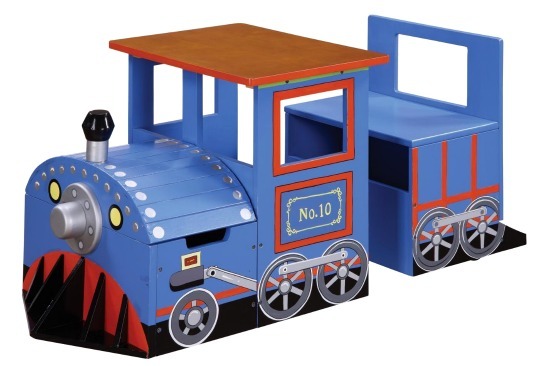 This could be a great alternative to a regular train table for younger children or smaller spaces. I like the idea of the crane that can move freight (and maybe even engines?) between the tiers, and it could be fun to build a larger train layout on the floor that comes in and loops through the bottom level. 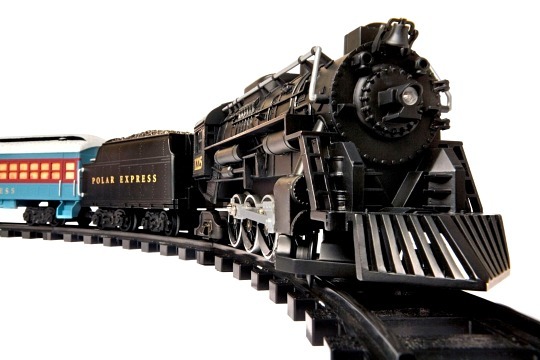 Made in the USA from sustainable hardwoods, this beautiful heirloom train set from Maple Landmark is a great choice if you think that wooden train sets should be made almost entirely from wood. I love the railroad tie details on the track. I want this set so much! 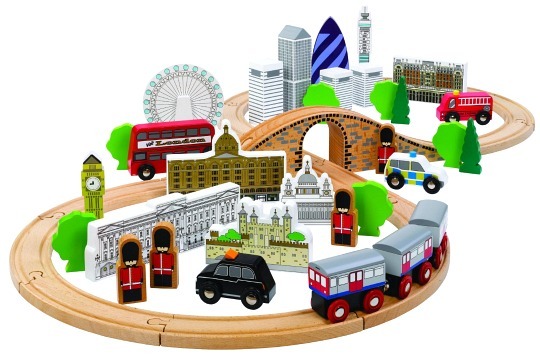 I love all the little wooden London landmarks. And after poking around on Amazon.co.uk, it seems like this is a well-liked brand. Another travel-themed wooden train set I’ve long been admiring is the Bigjigs Rail Around the World Train Set, which has wooden world landmarks for your child’s trains to visit. This is a pretty cool looking set. I like the platform elements Fisher Price has been adding into the Thomas Wooden Railway sets, and this one is perhaps my favorite. (Plus, I like that itty bitty Bulstrode!) 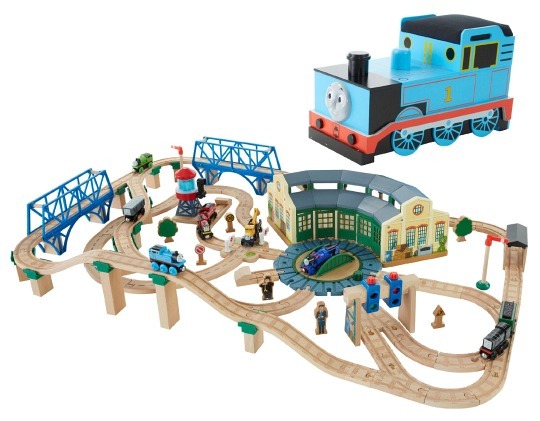 Other Thomas wooden train sets with platforms include the Mountaintop Supply Run Set, Thomas’ Fossil Run Train Set, and the King of the Railway Set. These heirloom-quality, Made-in-the-USA alphabet train sets from Maple Landmark are compatible with regular magnetic wooden trains and wooden track. You can buy NameTrain sets that just have the letters of your child’s name, but I love the idea of having a whole alphabet to learn letters and then practice forming words while playing trains. Bigjigs Rail also makes a line of letter and number trains ( US / UK ), but the cars have to be purchased individually. 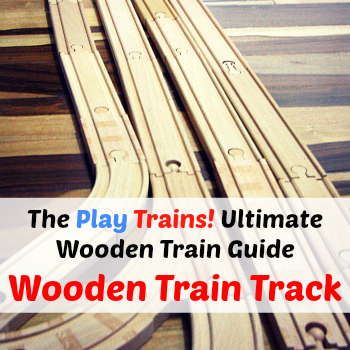 For more wooden train sets, and lots of information about the different wooden train brands, check out our Guide to the Best Wooden Train Sets. 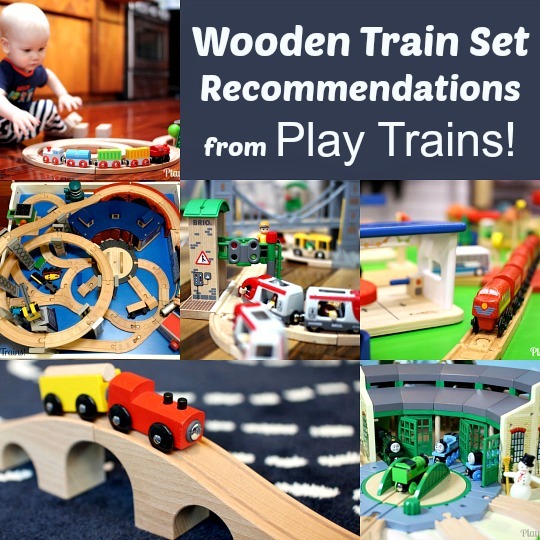 And for more information and recommendations about wooden trains in general, see all the posts in our ongoing Play Trains! 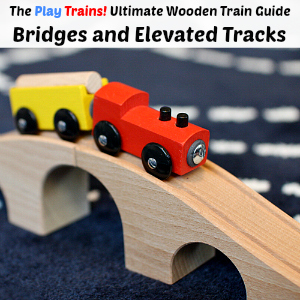 Ultimate Wooden Train Guide. This set is super fun! 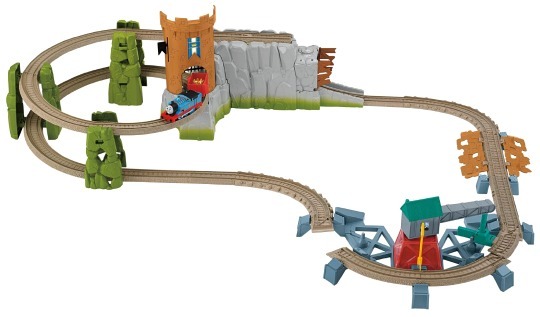 There’s a crane to swing a section of track around just in time for Thomas to chuff across it, a spiral track for him to chug up, and a crown that falls into his freight car as he zooms down through the tunnel. We’ve had a lot of fun trying to find other objects that are the right size and shape to replace the crown and drop into the freight car. 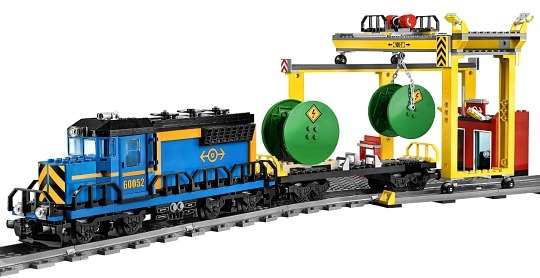 This seems to be the big TrackMaster set for 2014. This TrackMaster Thomas has special wheels with teeth to get up that super steep slope, presenting an opportunity to learn about real world trains that use similar wheels to get up mountains. And when Thomas gets to the top, the “avalanche” tips him across the gap to the other track. In theory. We’ve watched a video of this set on YouTube, and it seems like Thomas crashes as often as he hits the track. Which the Little Engineer thinks is hilarious, so if you have the type of kid who would think that was a feature rather than a flaw and not get frustrated with it, this could be a fun set to play with. 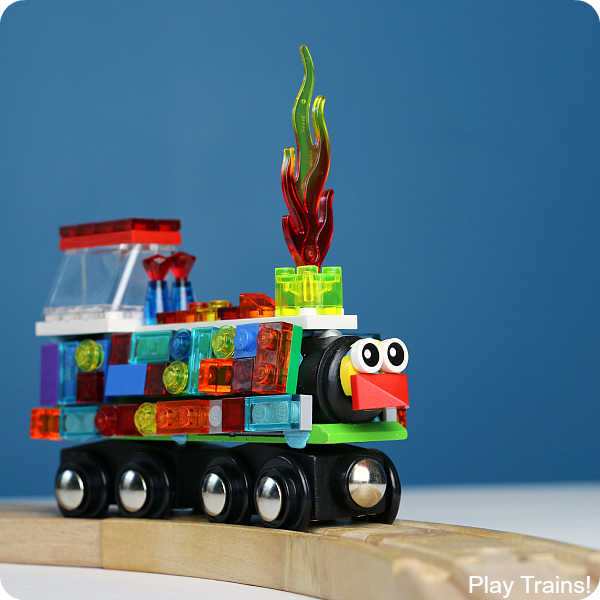 Power Trains are a great midpoint for kids wanting to move from wooden trains or TrackMaster trains to real model trains. These plastic train sets are much higher quality than you would expect — something I read again and again in reviews, and then experienced for myself when we got our first Power Trains set. They require a child to develop some of the patience, care, and skills it takes to run a model train, yet the trains themselves put up with all of the abuse that comes from these skills being learned in a hands-on sort of way. 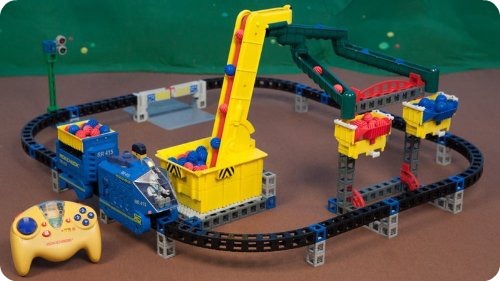 This Mega Holiday Set is the biggest Power Trains set I’ve encountered, and it looks like it would be super fun on Christmas morning. I saw it at Toys’R’Us last year — it’s an exclusive set for them — so you might want to see if they have it again this year and compare prices. The Little Engineer got this set to go under the tree on Christmas morning, and it is so charming! Thomas’ eyes move back and forth, and the train and figures look fantastic. I was glad I carefully read the Amazon reviews, so I was forewarned that running the train for too long can melt the plastic inside. Knowing that ahead of time and carefully following the printed instructions, we had no problems with it. We got the Bachmann Troublesome Truck #1 and Troublesome Truck #2 to go with it, and the Little Engineer had fun giving rides to his new LEGO mini figures under the tree. 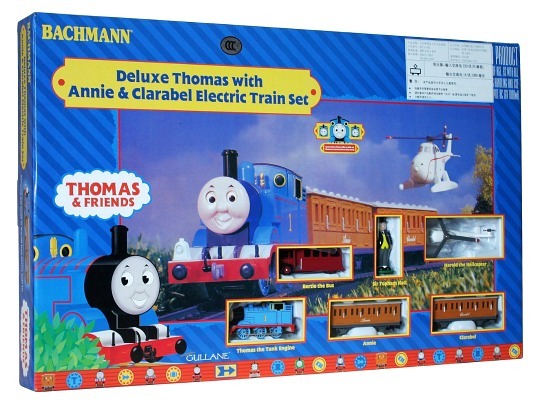 Bachmann also makes a smaller Thomas with Annie and Clarabel HO Scale Train Set that includes just Thomas, his coaches, a circle of track, and a power pack and speed controller. That one might be a bit easier to fit under the tree if you don’t have a great deal of floor space available. This looks like a great model train set to go under a Christmas tree, especially with the Polar Express theme! It’s battery-operated, with a remote control, and from the reviews I read it sounds like it stands up to children operating it. (I would recommend carefully reading the reviews of any model train set you consider buying, because it seems like you can avoid a lot of mistakes by learning from those with experience!) Pair this with the Polar Express book or movie, some hot cocoa, and a bell for each child. There are many more model train sets that get good reviews on Amazon. I’m just starting to learn about them all and find more to recommend, so in the meantime, I recommend browsing the model train set category there and reading lots of reviews. It worked out for us when we got our first model train set last year! 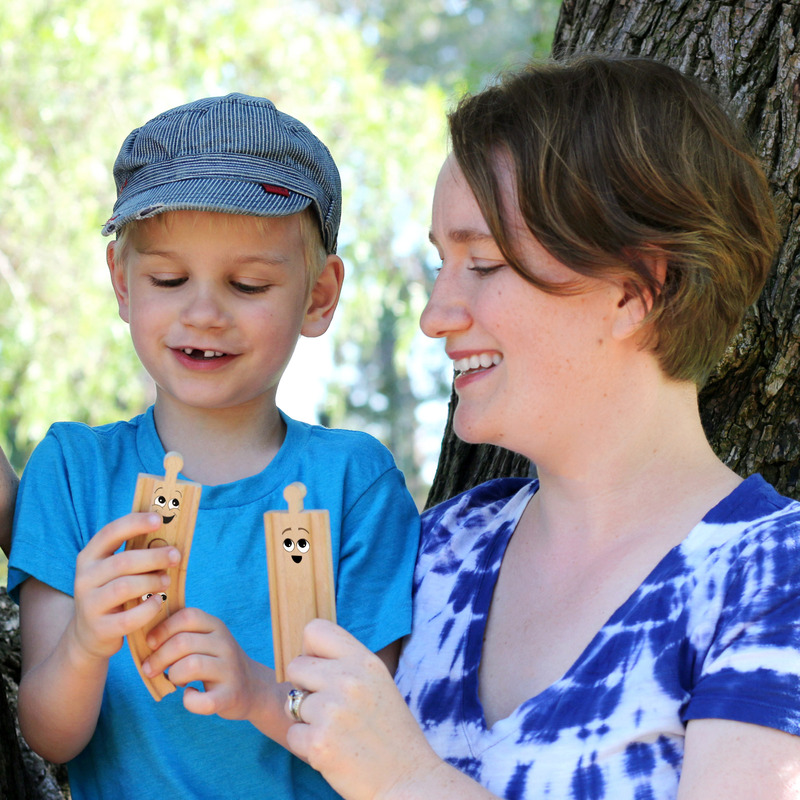 We first learned about Rokenbok construction toys from their fun videos on YouTube. The Rokenbok Monorail Mania Complete Action Set is on my short list for potential presents for the Little Engineer’s birthday this year. I’ve read several reviews of Rokenbok toys praising their appeal to a wide range of ages, as children go from having fun playing with the set after a parent or older sibling has set it up to building it themselves. And it coordinates with all of the other Rokenbok sets, so it’s a set we could add to for years to come. The Little Engineer thought it was really cool when we realized last year that roller coasters are trains, too. 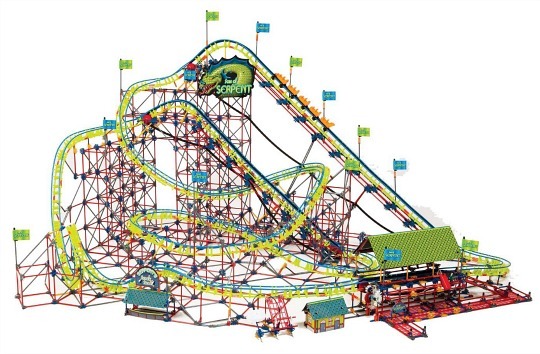 And for a toy roller coaster, this set is totally nuts! It builds a huge roller coaster. While this looks to be best for teenagers to tackle, K’NEX makes smaller — and less expensive — roller coasters for ages 9 and up, like the Typhoon Frenzy Roller Coaster and the Crossfire Chaos Roller Coaster building sets. The Little Engineer got the DUPLO My First Train Set for Christmas last year and — despite his having mostly moved on from DUPLO to regular LEGO by then — he absolutely loved it. It was one of the most played with gifts that he got. The cute little steam engine is motorized, and when you go fill up at the “water tower”, there a glug glug glug sound effect that made it even more fun for him. We love this set and highly recommend it. This set is so cool. My husband bought it to build and then play with it together with the Little Engineer, and we were really impressed with all of the details on the freight cars and in the cargo station. I would recommend it for kids old enough to build it themselves, or to build with or for kids who are ready to play with model trains carefully. 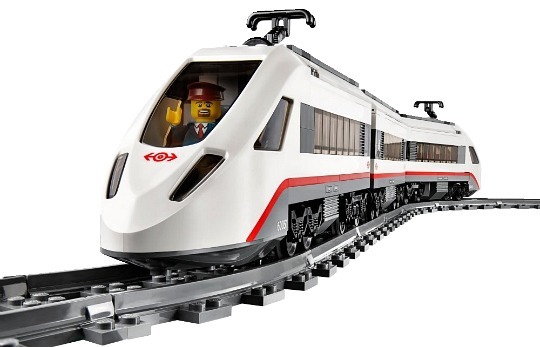 This high-speed passenger train set from the LEGO City line looks like so much fun! A great gift for older kids who want to combine their love of LEGO with their love of trains. A bright orange, high-speed train from the LEGO Creator line, the Horizon Express Train is perfect for older, advanced LEGO builders. 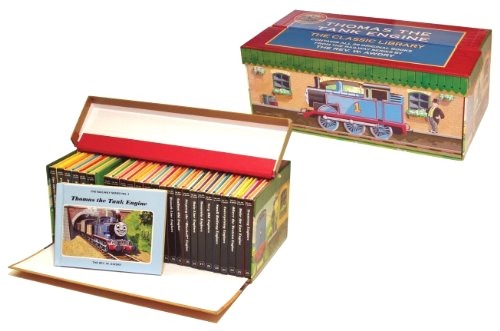 This beautiful boxed set of the original Thomas the Tank Engine stories in their classic format is something that I wish I could get for the Little Engineer! We own both The Thomas the Tank Engine Story Collection and the older, out-of-print (but complete and less Americanized) Thomas the Tank Engine: The Complete Collection, but both are big, heavy books and very hard for little hands to hold. The stories would be so much more enticing and accessible to him in their original form: individual books, each containing a few Thomas stories. I’ve seen the Thomas the Tank Engine Classic Library in person, and it’s quite lovely and impressive! Image © 2008 Christopher Vine. This series of five hardcover chapter books should be in the library of every train-loving kid, and every future engineer. 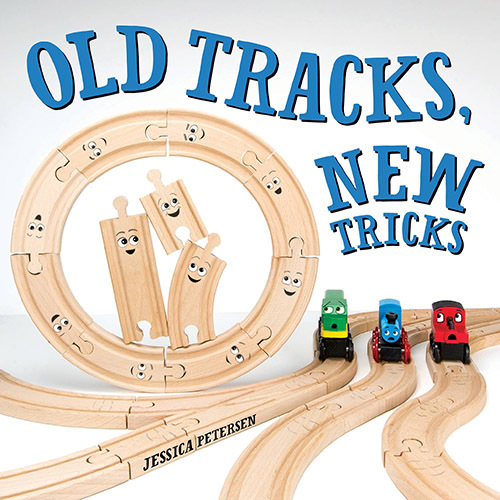 The books tell the story of Peter and his grandpa as they build a 1/8 scale railway to connect Peter’s house to his grandparents’ farm. As the series progresses, Peter and Grandpa Gerald tackle more and more challenging projects: extending their railway, restoring an antique steam engine, building a water wheel to provide electricity to the house and farm, and so on. Written by a professional engineer with a lifelong love of trains, the beauty of the Peter’s Railway stories is that they are suitable for any child who can sit still for them — the Little Engineer was enthralled with them at the age of three — but they also appeal to older children. This is thanks to the How it Works pages between chapters, which are clear, fully-illustrated explanations of the technical concepts in the books. The same concepts are presented both in the story and in the technical pages, reinforcing them in the child’s mind. 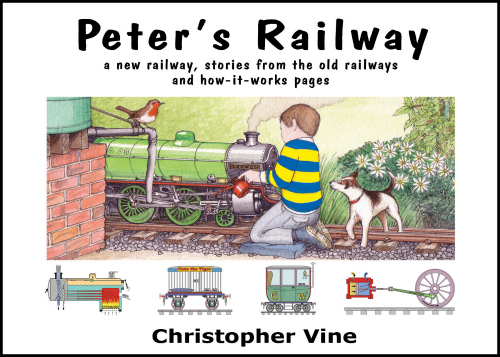 You can read more of my gushing about this series in my review of the Peter’s Railway books from last year! In the UK? 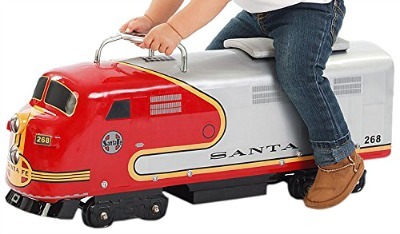 I couldn’t find any of these available on your side of the ocean, but check out the ride-on trains for kids available on Amazon.co.uk. 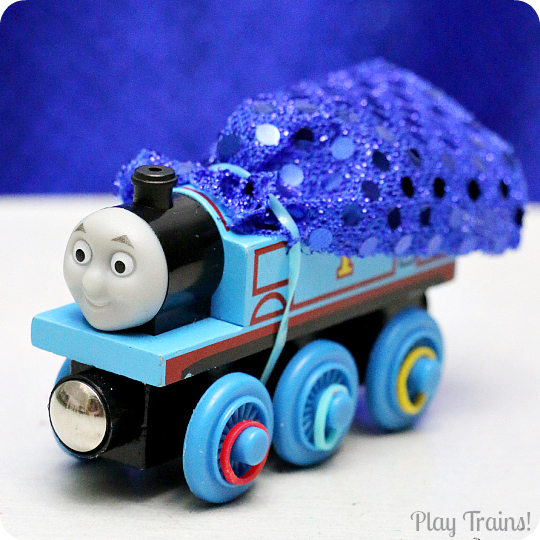 This ride-on Thomas will encourage plenty of pretend play in a Thomas-loving toddler! 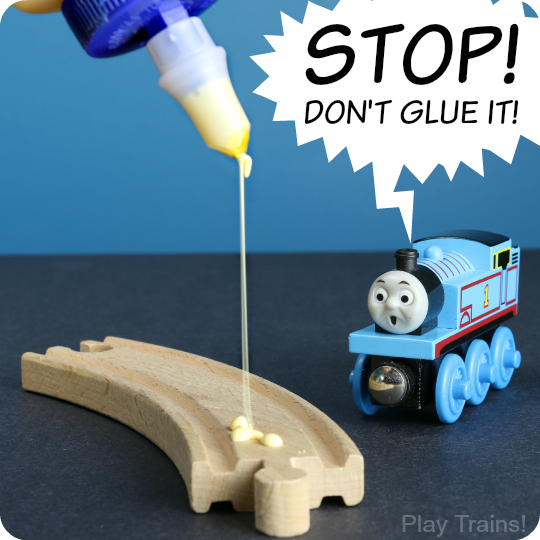 Based on our experience with the Peg Perego ride-on Thomas, I suggest giving this with a toy tool set so your child can “fix” Thomas when he “breaks down”. The Little Engineer has continued to enjoy that activity even after the thrill of the ride has faded. 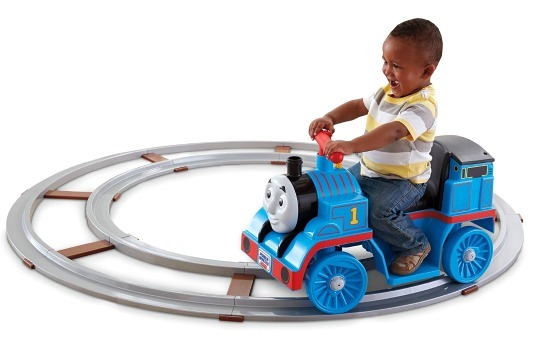 You can also purchase Power Wheels Thomas by itself, if you don’t have room for the track. We have the Peg Perego Thomas the Tank Engine ride-on at my mom’s house. They don’t seem to be made anymore, but she found two of them on Craigslist, and also ordered extra track to make a figure eight layout. This non-Thomas version looks just as fun! Doesn’t this look ridiculously fun? I kind of wish I could go back in time three years and put this in our backyard! 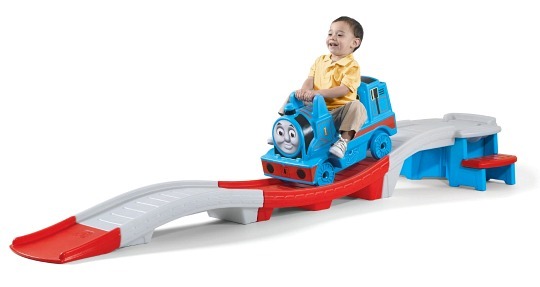 If you don’t do Thomas & Friends at your house, there’s also a plain version of the Up & Down Coaster. The Little Engineer got to play on one of those when he was a toddler. So, so fun! This pretty, classic ride-on version of the famous Santa Fe diesel engine gets great reviews. It’s a good choice for a child who’s interested in real trains. Okay, this isn’t exactly a ride-on train, but that’s how it gets used at our house! The Little Engineer enjoys all of the “controls” and the sound effects, and it helped get him interested in riding after he decided he didn’t like his balance bike. 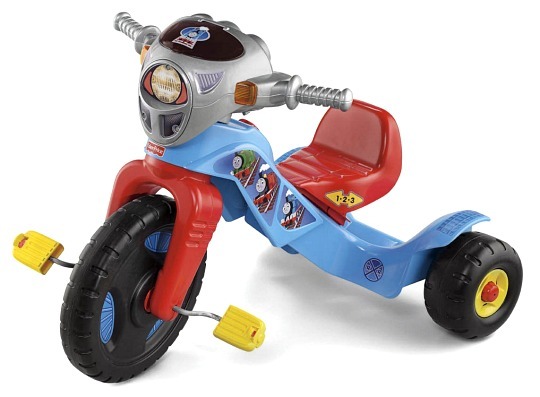 There is a somewhat less-expensive Thomas tricycle, too, but the Little Engineer had his heart set on this one. This pretty train writing desk would do double-duty as a desk and as a pretend play train. And I can just see my Little Engineer opening that drawer on the side of the “boiler” to pretend to fix his engine! It’s painted closely enough to Thomas to please most Thomas & Friends fans without it actually being Thomas. The Little Engineer loves to pretend his bed is a train. 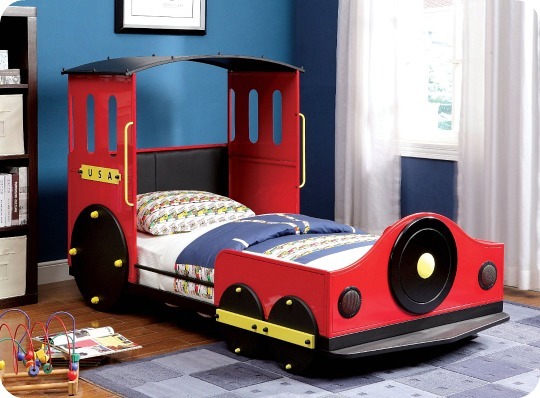 I can only imagine how much more fun it would be if his bed looked like a train! 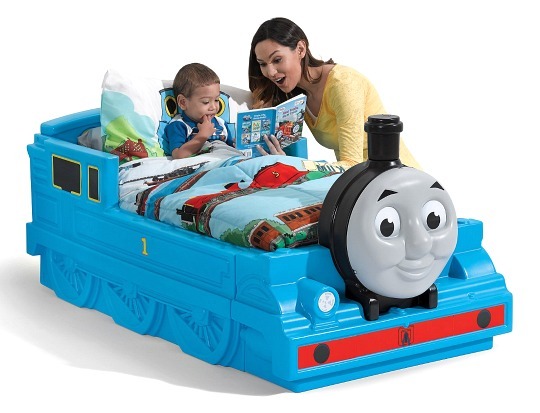 If you live in the UK, the Step2 bed isn’t available, but I think I like this Thomas the Tank Engine Toddler Bed that’s available there even more. Another train bed, this time with a more classic look. This would be another fun one to play Big Engine in! 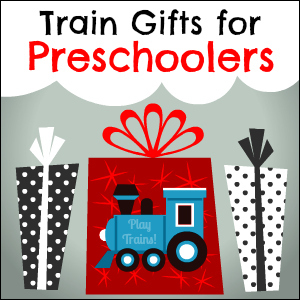 This train gift guide is part of a Gift Guides for Kids collaboration, brought to you by members of the Kid Blogger Network. 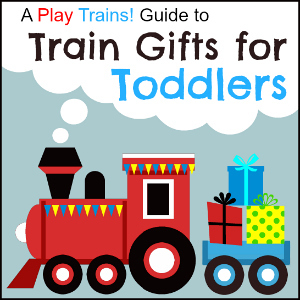 This is our second year participating in this awesome event — last year, we shared our list of Train Gifts for Toddlers — and it’s so helpful to have such a wide range of gift lists, for every age, interest, and budget! 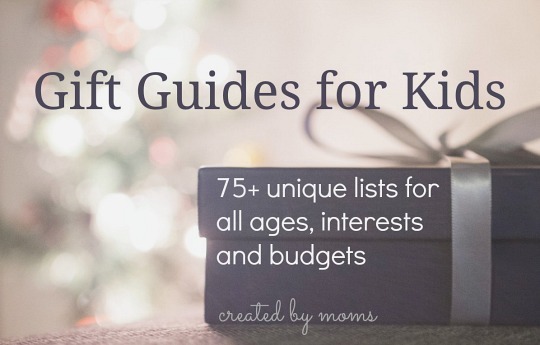 You can browse and follow the Gift Guides for Kids board on Pinterest for even more gift guides. 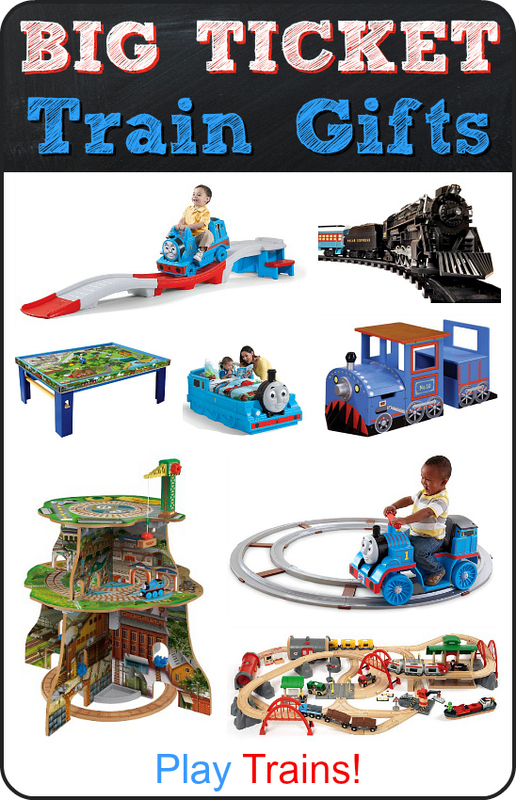 I’m looking at “train table with Percy &Talking Thomas” in the CP Toys by constructive Playthings catalog. it looks great, but I don’t see it anywhere on your blog. Any reference to this? Thanks and Happy New Year. It’s certainly a cute table! I don’t have any personal experience with it, but I can point you toward the reviews people have left on Amazon. Some people rate it highly, others very low, so reading over them might give you a better idea of what to expect. If you haven’t already seen them, I also have some posts about train tables and train sets that you might find useful.